CIS thanks Goodwill Industries of SETX & SWLA, Inc.
Communities In Schools of Southeast Texas wants to take this time to thank Goodwill Industries of SETX & SWLA for their generous donations of children’s books for each of our Bring Your Dad to Story Night Events. 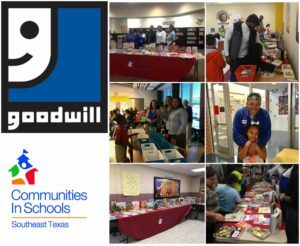 We have successfully held 9 literacy nights at various CIS Elementary campuses, which could not have been possible without the donations from our community partner, Goodwill. Special thanks goes to Goodwill’s Executive Director, Kim Picard, and her team for helping CISSET encourage so many students and families to read together.